As a sister conference to SCCS-Cambridge, SCCS-Bengaluru focuses on attracting student participants, primarily from countries in South and South-east Asia, and Africa. The 2018 conference will be held at the JN Tata Auditorium, Indian Institute of Science, Bengaluru (INDIA), from 27th to 30th September 2018. 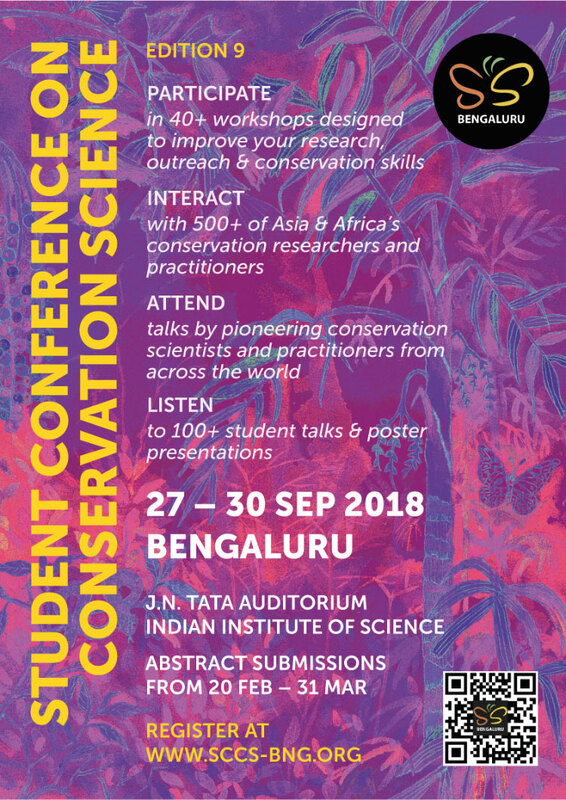 SCCS-Bengaluru is a four-day conference that includes short and long workshops, targeted at students for capacity-building in areas of conservation research and practice. The conference will include six plenary talks, and close to 20 student talks and 80 poster presentations. The morning plenaries will be more technical talks while the evening talks will describe various practical facets of conservation. SCCS will also have an extended Who’s Who in Conservation session to learn about the work done by a diversity of academic institutions and conservation organisations, and to discover work and research opportunities they offer. Call for films: for student filmmakers and amateur filmmakers to screen their short films during SCCS.